From subtle jest to more ridiculous tomfoolery, here are our top 12 April Fool’s Day pranks of 2017. Remember those really cool scratch and sniff books your mum bought you when you were little? Endless fun. 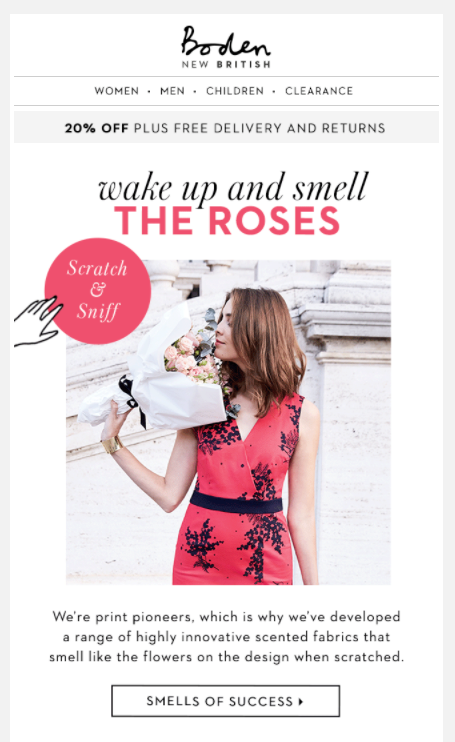 Which is why we struggled to contain our excitement when we saw this email from Boden announcing a new range of scented fabrics. Accepting the range was fake wasn't easy. Jumping on the technology bandwagon, Wayfair decided to fool consumers into believing it had created the world's first voice-controlled smart sofa: Sofia. In a video on the retailer’s website, the couch is filmed reminding its owner when they had their last glass of wine (before agreeing to give them a massage) and reprimanding the owner's children for jumping up and down on it. Click the image below to watch! 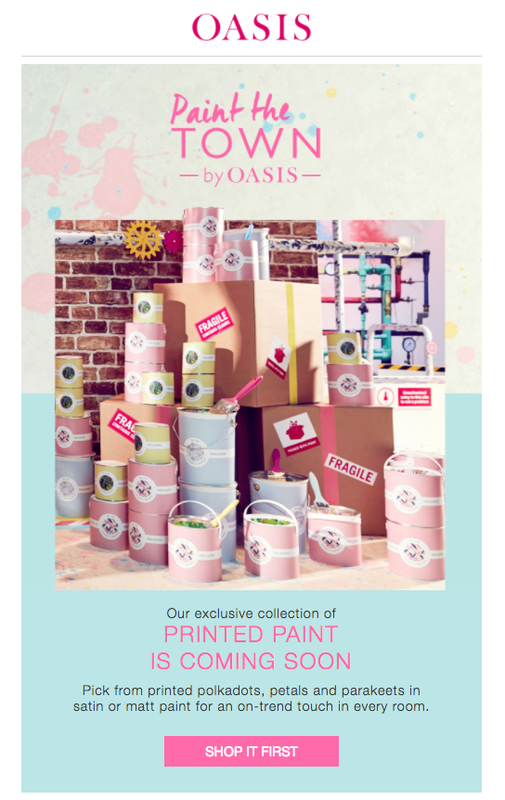 On Saturday, Oasis announced it would be taking on the world of interior design with "printed paint". According to the brand's email, shoppers would be able to choose from polkadots, petals and parakeets —all of which would appear on their wall in the stroke of a brush. One Ometrian actually believed this. In a bid to combat the ongoing issue of parcel fraud, Zappos took to YouTube to reveal its brand new creation: the in secure box. But, for all its perks, is an invisible box really that practical? Video = laugh out loud good. 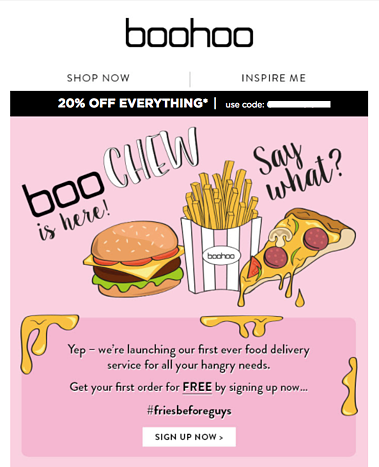 Boohoo couldn’t resist tricking its army of loyal followers into believing it was launching a food delivery service to cater to all their “hangry needs”. From template design to tone of voice, the spot-on marketing in this email had us signing up pronto. April 1st marked the first day of ASOS’ new delivery option: Model Delivery. You can even choose which model you want at your door, parcel in tow. (We’ll have Joshua, please). Super Furry ... watches? This video introducing Analog Watch Company’s The Companion Collection had us cryin’ with laughter. Brownie points for attention to detail. Thought your ceramic bird bath was swish? How about splashing out on a hot tub for birds. Wilko asked its consumers to "share snaps of the little starlings enjoying a dip in the hot tub on Twitter" before admitting it was a prank. Judging by the retweets at at least six people believed it—not bad! A wine called Whoops Juice, carefully crafted using grapes from ... Benidorm. And there we were thinking Moleskine was more trees than technology. The Italian papermaker announced on Facebook it had created a docking station that could let users take notes and charge their phone all in one place, with "no USB needed thanks to new PaperTricity™ technology". 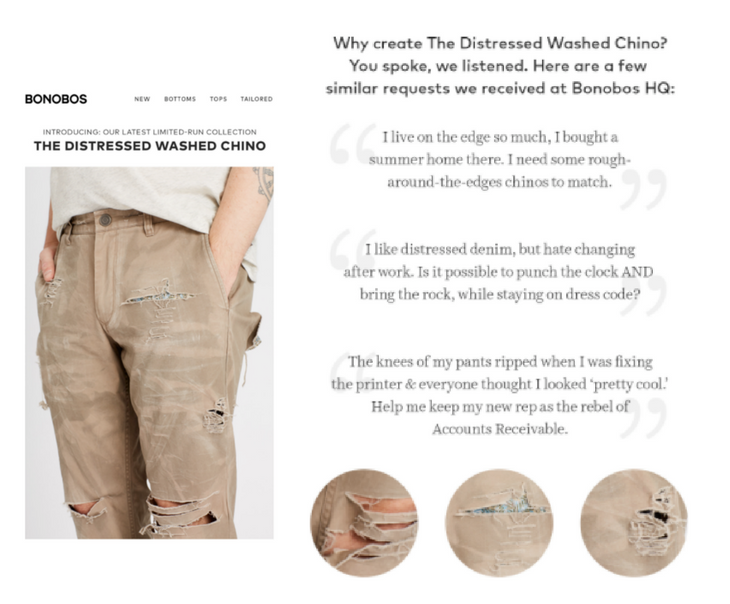 Distressed chinos, anyone? What we love most about this April Fools' email is the round up of quotes from the folks over at Bonobos HQ (shown on the right handside below). P.S. Bet your bottom dollar at least one poor blighter tried to add these to his basket. Think it through: The more thorough and planned your April Fools' the better. People like detail. People like effort. The cleverer the joke, the funnier it is. And that's not to say slapstick can't be funny! Make it amusing to *your* audience: Different brands gave different demographics, who in-turn will have a different sense of humour. What might make one die hard M&S fan chuckle may fail to raise even a smile from a Missguided girl. Think about it. Give something back: If your April Fools' joke requires interaction (such as clicking-through, signing up or retweeting etc), make it worth each person's while. For example, you could offer some extra funny content (such as your team leaving a video message), let them in on a private joke or even offer a (fun) prize.